Below is an article that I wrote for V!VA Travel Guides, published on their website and in their print guidebook. It’s about the city that has been my home for four years. 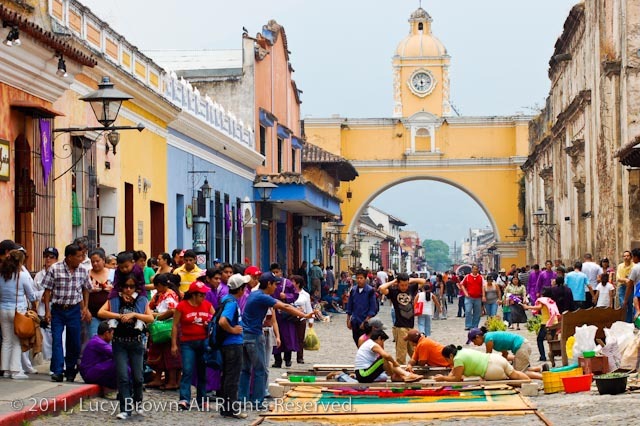 Also check out my article on International Living’s website Living in Antigua, Guatemala: An Expat’s View. 1. The city center. 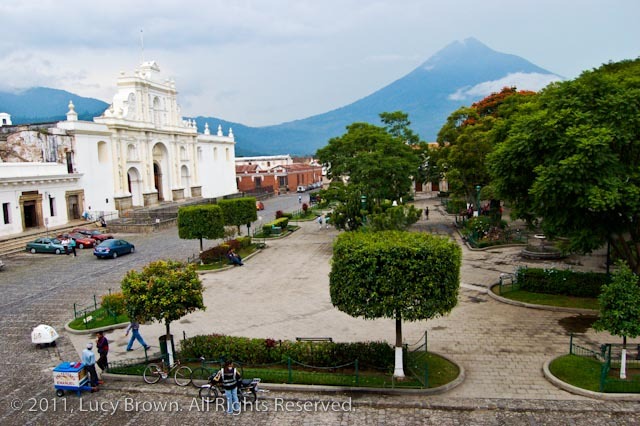 The cathedral and central plaza (Parque Central) against the backdrop of Agua volcano. 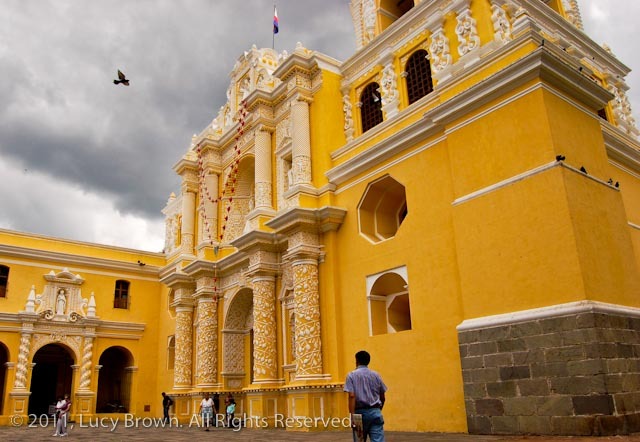 In a highland valley some 1500 meters above sea level, the charming colonial city of Antigua lies, surrounded by three volcanoes. 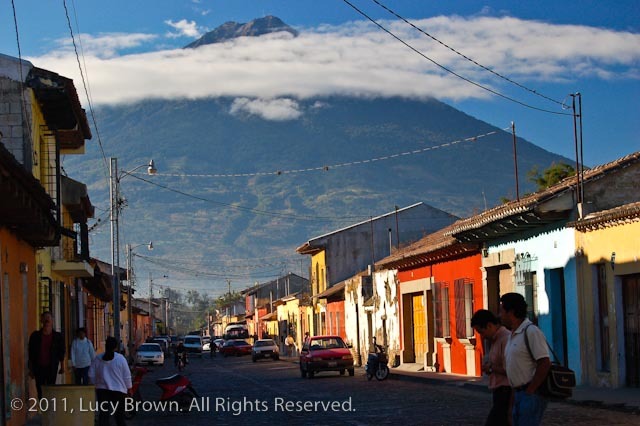 It’s tickled by the skirts of the extinct Volcán de Agua to the south and is within the gaze of two (one dormant and one active) volcanoes to the southwest, the double-ridged peak of Volcán Acatenango and the smoking Volcán Fuego. 2. Antigua sheltering in the folds of Agua volcano. 3. 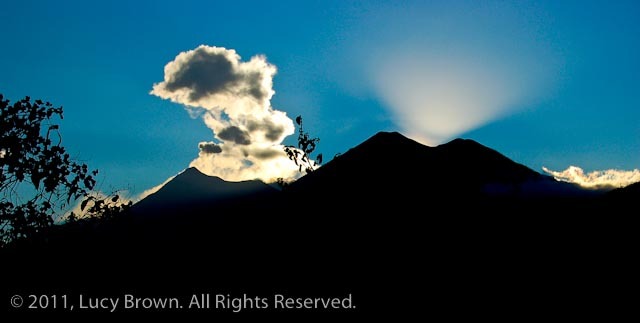 Volcanoes Fuego and Acatenango at sunset. Nowadays, Antigua’s population stands at about 47,000 and its status as a world heritage site has preserved and restored its colonial architecture and old-world appeal. The local government only approves certain shades to paint the exterior walls of buildings and prohibits the display of signs or notices that are out of character with the rest of the city. Cobblestone streets are splashed with colorful house and shop fronts and old churches and crumbling ruins are dotted throughout. 4. 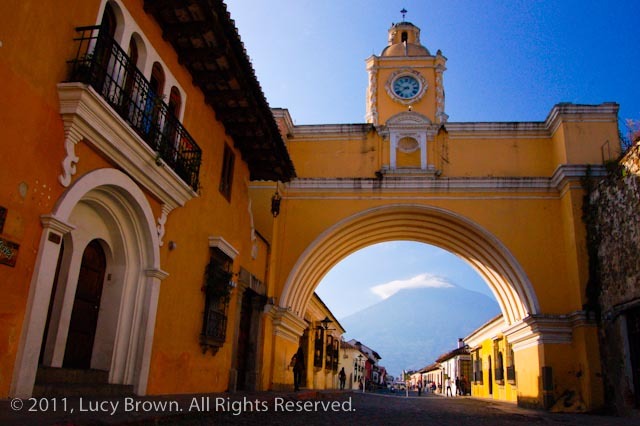 Antigua's landmark arch with Agua Volcano peering beneath it. 5. 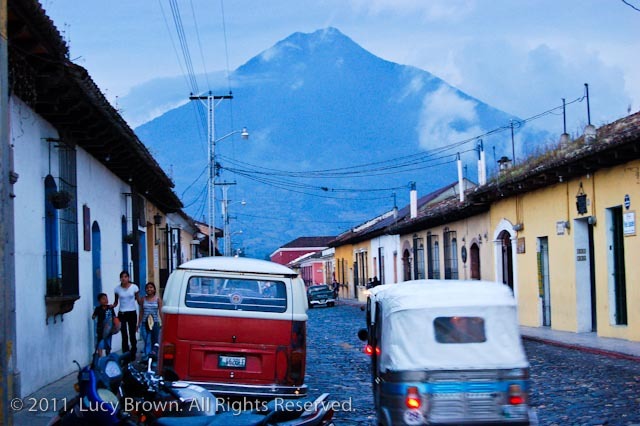 Agua volcano looming over the colorful streets. 6. 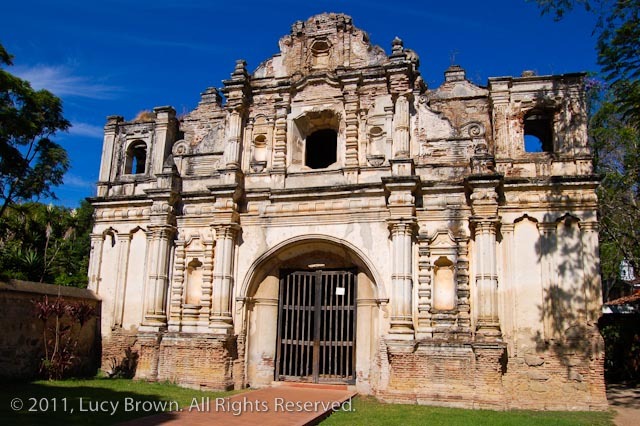 Distinctive La Merced church. 7. Antigua at the hemline of Agua volcano's skirts. View from Cerro de la Cruz. 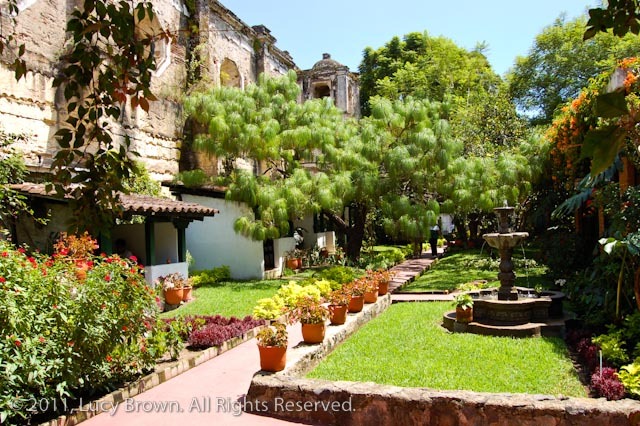 If your time is limited, take a city walking tour of the main sights, ruins and museums. Wander through the handicrafts market to pick up souvenirs and take a look at how jade is transformed into jewelry and masks in one of the store factories. 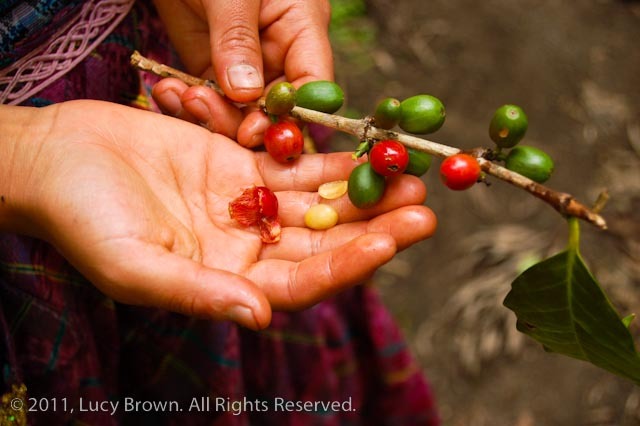 Get out-of-town to visit a coffee plantation and trek up to the edge of a flowing river of red-hot lava on Volcán Pacaya. 8. The central fountain in Parque Central overlooked by the cathedral. 9. 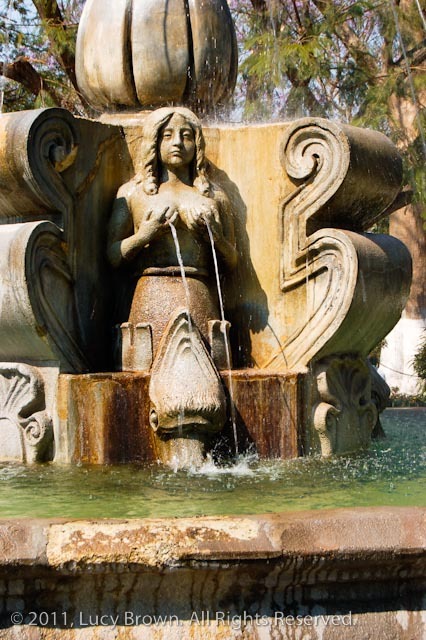 The carved stone fountain adorned with mermaids spouting water from their bare breasts is the focal point of Parque Central. 10. The main tourist drag, the 5th Avenida. 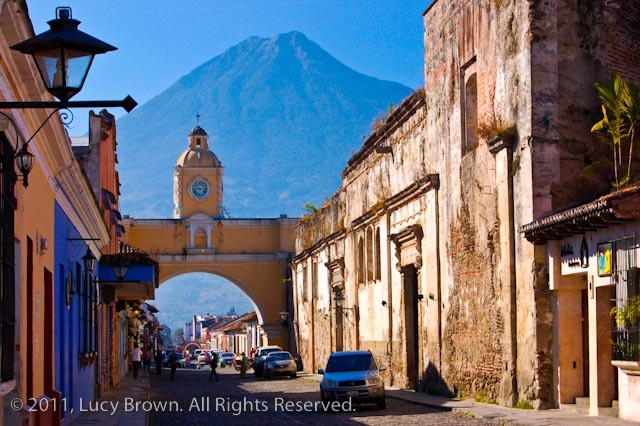 Lined with shops, restaurants and bars, spanned by the iconic Arco de Catalina and watched over by Agua volcano. 11. 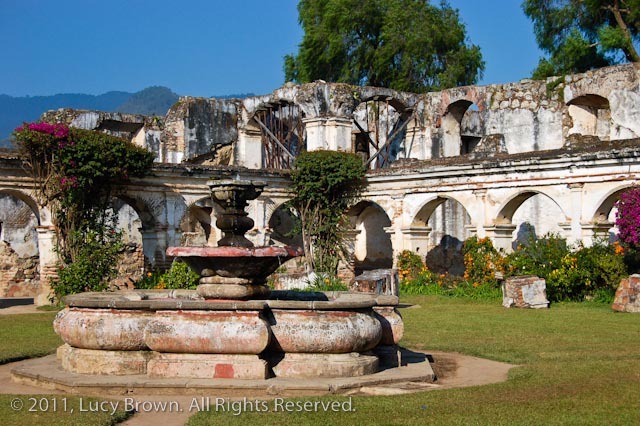 The ruins of San José el Viejo. 13. 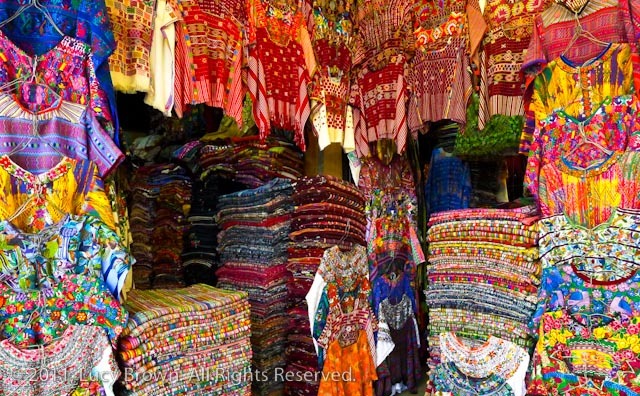 Exquisite, handmade huipiles in the handicrafts market. 14. 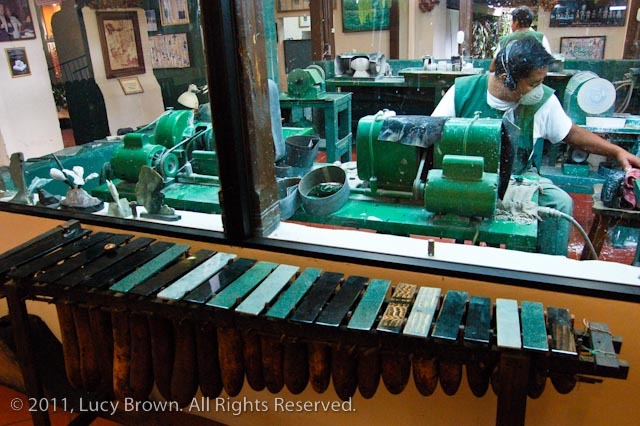 A jade factory inside a jewelry store. 16. Within arm's reach of red-hot lava on Volcán Pacaya. 20. 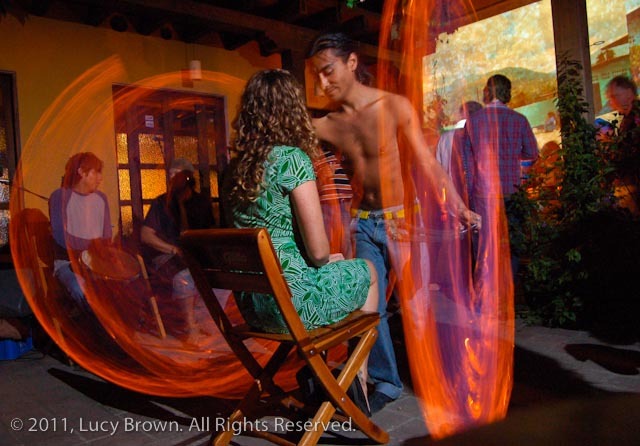 Fire artist performing during a fund-raising event in a popular bar. Scores are lured by the well-earned reputation of the city as one of the choice spots to study Spanish and there are hordes of language schools of all calibers vying for the bucks. 21. This high-end Spanish school has individual classrooms in a beautiful garden overlooked by ruins. Many of the schools have ample courtyards and gardens to study in. Volunteering opportunities are endless both in Antigua and in outlying areas with NGO organizations and projects all focusing on different social, educational, health and environmental issues. 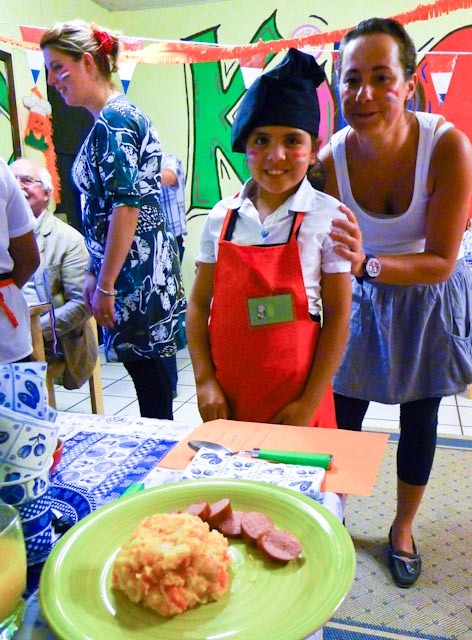 Many students invest their afternoons donating whatever skills they can offer. 22. The KIDS Restaurant is a T.E.S.S. Unlimited project to help kids learn English, develop social skills and learn to work as part of a team. 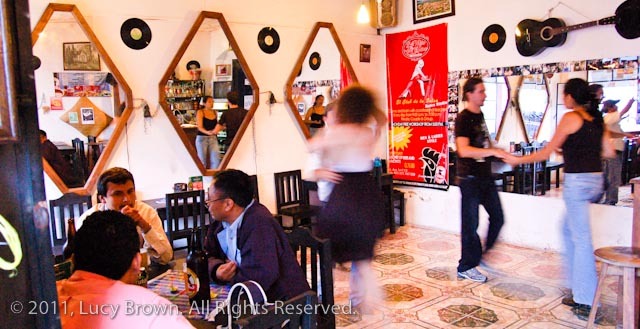 Forever a popular place to learn salsa, there are qualified instructors running classes for all levels in dance studios around town. 23. 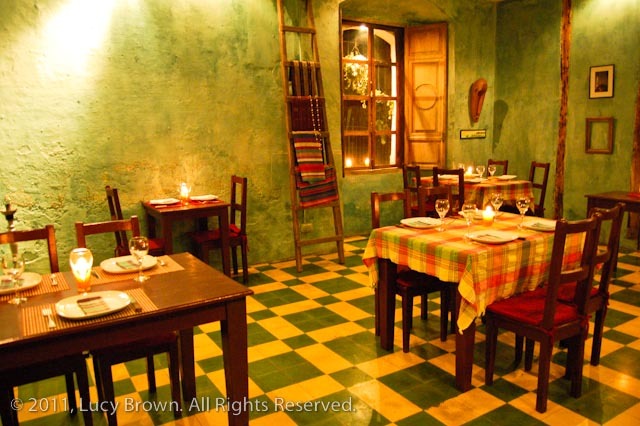 A restaurant based salsa studio. 24. 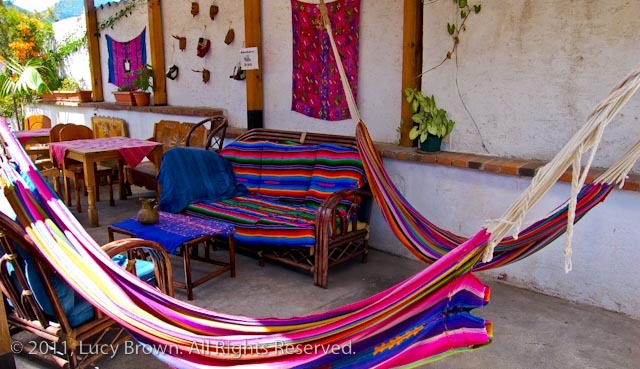 Guatemalan style hostel terrace. 26. 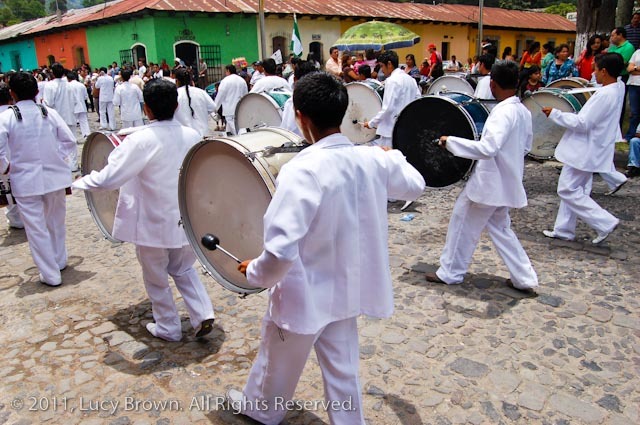 A desfile or parade to celebrate Antigua's patron saint's day. 27. 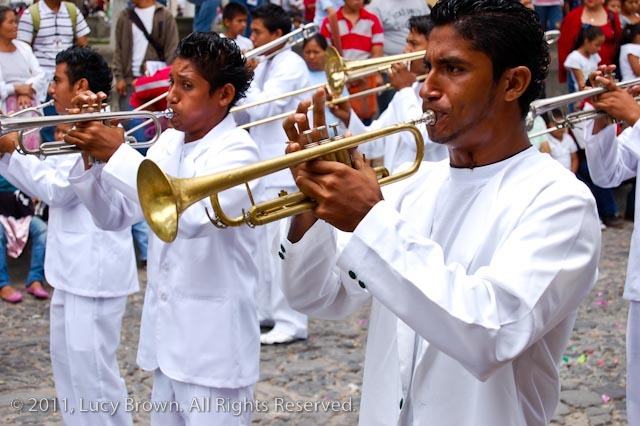 Trumpeters sweating under the strain and heat. 28. This desfile marched and thundered straight past my house. 29. 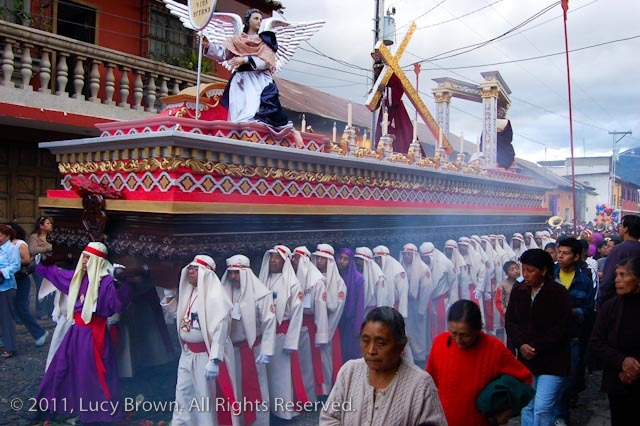 Procession during Semana Santa. 30. Finished stained sawdust and pine needle alfombras waiting for the procession to pass. 31. The 5th Avenida during Semana Santa. 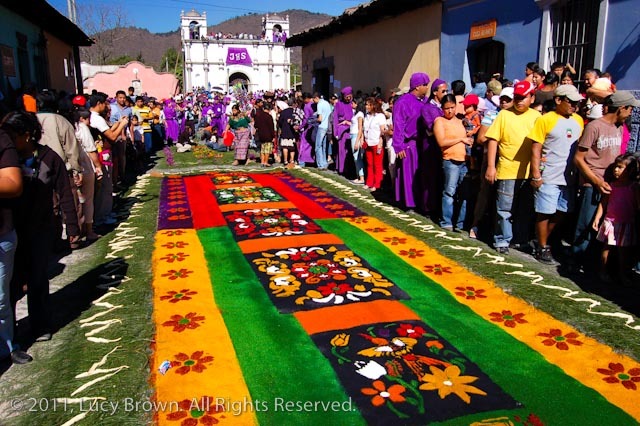 Making intricate sawdust alfombras in the path of a procession. 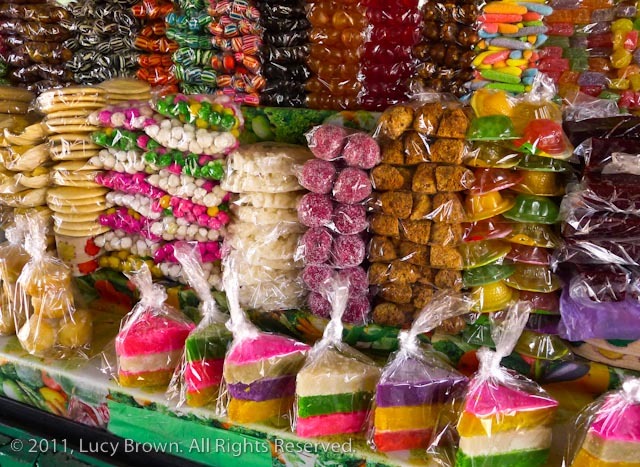 This entry was posted on March 14, 2011 by loca4motion. 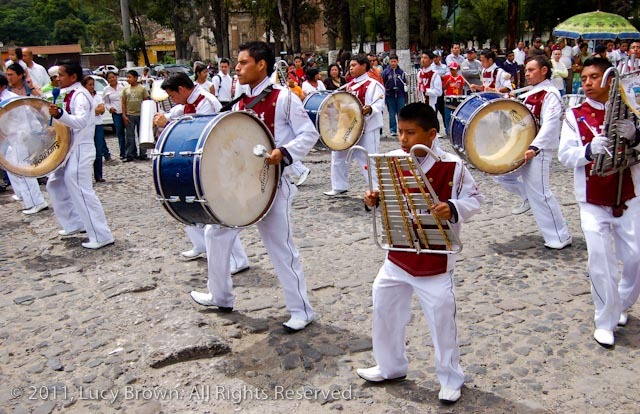 It was filed under Central America, Guatemala and was tagged with alfombras, antigua, candies, cathedral, cerro de la cruz, day of santiago, día de santiago, el arco, guatemala, huipil, jade factory, jade marimba, la merced, mermaid fountain, parade, parque central, photography, procession, san josé el viejo, santa clara, semana santa, street food, volcano, volcán de acatenango, volcán de agua, volcán de fuego, volcán pacaya. Thank you so much for taking the time to comment. 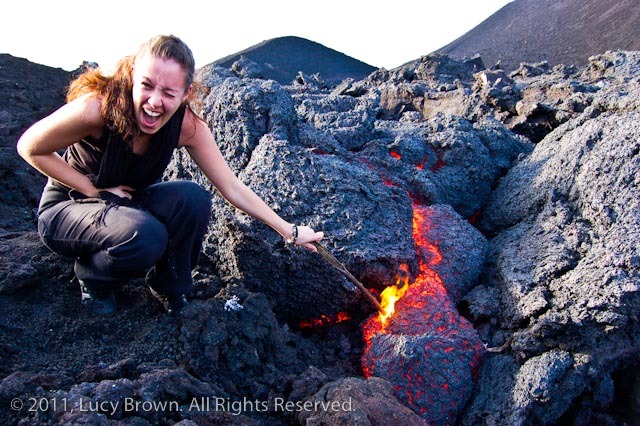 I don’t think there are many places in the world where you can get within arm’s reach of red hot lava! Yet another fantastic post! I love your colorful pictures and hope to someday visit! Great article…keep them coming! Thanks so much! Let me know if you visit, I’d love to show you around! It’s definitely not off the beaten path but it’s well worth a visit. I adore Antigua. It’s so bright and colourful; well captured in your beautiful photos. Thank you! It’s such a photogenic place and there’s always something new to photograph no matter how long you’re here for. Beautiful images capturing what Antigua is all about.. awww how I miss it!.. Wishing you more sucess and publications..
Wow! I am packing my bags and coming to join you… what fabulous photos! Thank you Caron! It’s an incredible place for photography. Let me know if you’re headed this way!!! Muchas gracias otra vez cruz del sur. Me alegra mucho que disfrutes mi blog! Great coverage of Antigua. 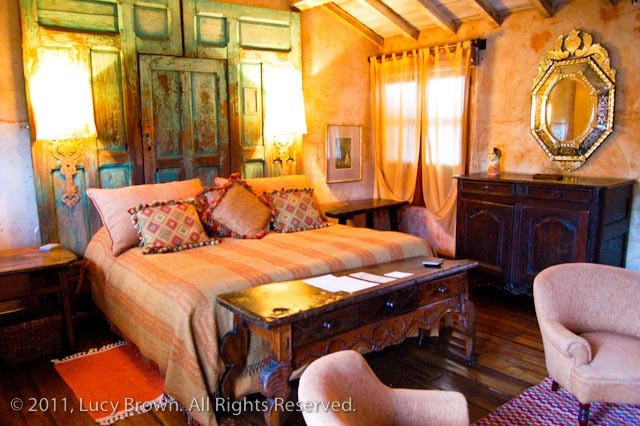 My babe and I are heading there for a vacation in preview before we decide to move there. 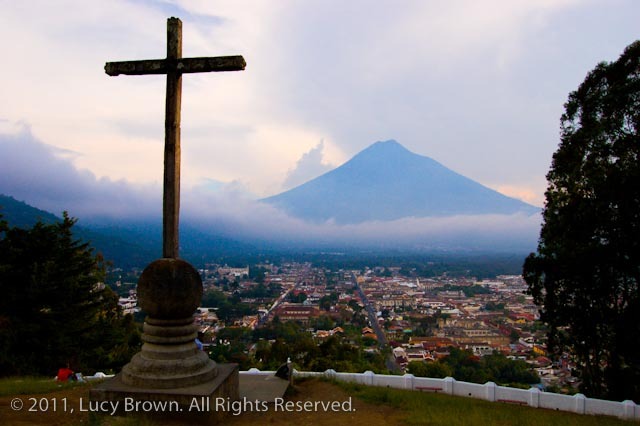 We hear that Guatemala can be somewhat dangerous, what’s your take on that? Thanks! It’s definitely a good idea to come and visit before deciding to move here. 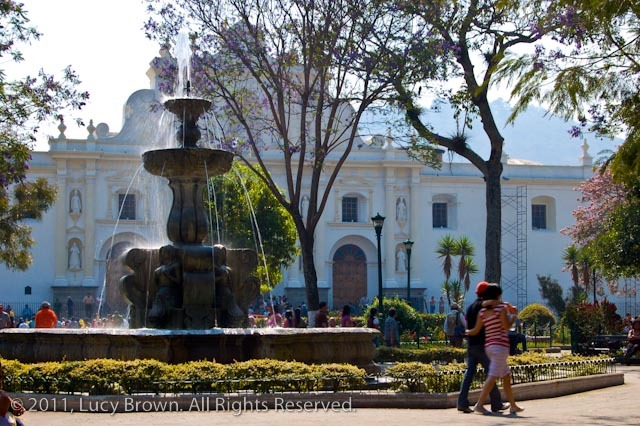 Guatemala does have safety issues but security is pretty good in places where tourists frequent such as Antigua and during daylight hours in populated areas of tourist destinations you’re unlikely to encounter problems. However in crowded places you do need to look out for pickpockets and bag slashers. Like anywhere it’s not advisable to walk around out of the city center late at night and I’d always advise taking a registered taxi then. In Guatemala City on the other hand there are much higher risks and it’s somewhere I go only if I need to. I think if you take the usual precautions when traveling you should lessen the risk of problems. 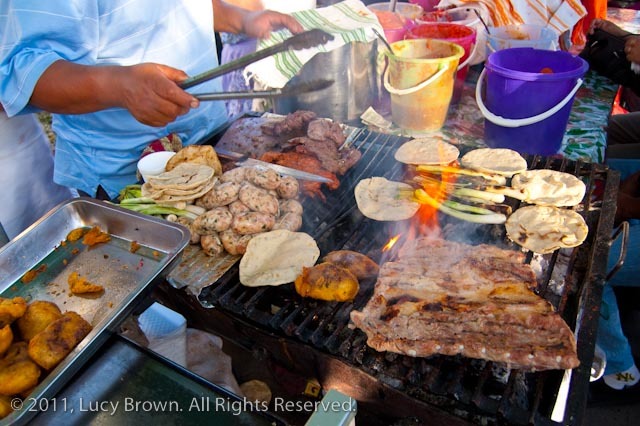 Hi Lucy great to see your enjoying life, travel and photography still. Your photos may have given me some inspiration for my love of painting. Im currently using water colours, but want to start using some oil paints a friend gave to me, as I think they would cover the depth and vibrancy more.